I have one pair of red and white Staffordshire dogs. They live in my kitchen window. I think they are very much in love. Watch as they steal a kiss. In three more days it will be Valentines Day. A real Christian Holiday,invented to celebrate several Saints, with the name of Valentine. Somewhere, through time, it has become a Holiday for lovers. Much like other holidays, it has taken on that commercial feeling. As soon, if not before, Christmas is over, all the Valentine stuff hits the shelves in our retail stores. It used to be mostly cards, then came flowers, thanks to the floral industry, and then candy, again thanks to the candy industry. I see things that are very tasteful and taste good, others are in very bad taste and even down right scary. To each his own, the words of my dear mother. Who's to say? I am sure what I like, would mean nothing to the next man. Some men will give there wife's or girlfriends candy, flowers, a night out ; where others, might chose a pair of naughty underwear or a tattoo.I fear the worst: but to them, it is the best. Prince Lepold from Austria and his bride. Rumor was they were very much in love. When I was in grade school, I loved Valentines Day. My mother would buy me a box of Valentines at the dime store. There was an assortment. I would carefully go through them and seek the best one for the girl I liked best. Usually they were addressed and taken to school and on Valentines Day, there would be a party. Our room mothers made a cake, candy and punch. My teachers always had a big decorated Valentine box that all the individual cards were placed in. One person got to hand out all the cards. They were opened one by one as we enjoyed the refreshments. I kept my cards for years. In the fourth grade my teacher had a drawing at the end of the party and gave away the big Valentine box..I won it, and it was the best thing that had ever happened to me. The next year I took it back to school and let everyone else enjoy it. For years I kept that box and all my Valentine cards in it. When my mother passed and we cleaned out her house, I found that old Valentine box. I had a weak moment and threw it out. I wish now I had it to share with you all today. Italian ceramic,"love doves." In the summer they are on the screen porch. I have lots of wild doves and the sweet sounds they make seem like they are coming from these two. I looked up a little Valentine Trivia to share with you today. A German couple in Court Dress. Down River Parlor mantle. Teachers receive the most Valentines cards, followed by students, mothers, wifes and then, sweethearts. Children ages 6 to 10 exchange more than 650 million Valentine cards with classmates, teachers and family. Approximately one billion Valentine Cards are exchanged on Feb. 14th, each year. One of a pair, English Pink Bristol vases, Down River parlor .This pair of love birds seem to be at odds. Or else, she is playing hard to get? Hallmark cards have over 1330 different Valentine cards to chose from. The red rose was a favorite flower of the God Zeus and the Roman Goddess of love. German, Meissen Court Couple. My favorites. They are so elegant and seem to be so refined. Ladies Parlor mantle. will come from South America. Romeo and Juliet, most famous lovers of all. A French couple in love. Sevres. Ladies Parlor pier mirror shelf. This couple, in love, are in the Master bed Room. A romantic Couple. he is giving her a song bird. They are French bisque . Ladies parlor. As we all prepare for this special day, keep in mind, what you are trying to say. If it is just a friend or family member, lover, wife or husband, mother, father, sister or brother, it is very important to say, " I love you!" One can never hear this enough. It makes us smile, feel good and want to love back. . I hope you all get lots and lots on Valentine card. I hope you send a few in return. Remember, to get, one has to give. We never, never, can do enough to show how much we care. RS Prussia, hand painted bowl, with a swan pair. This is the most romantic of all. Library book case. Please come by soon for a tour of, My Old Historic House. I will always leave the lights on and Sissy Dog will meet you at the door with a jump and a kiss. Get out there and buy those cards, candy and flowers. Share the love and, HAPPY VALENTINES DAY. .Cherubs have always been a big part of the celebration of Love and Valentines Day. Hand Pained german Ice Cream bowl with two couples on a picnic. Dish pantry, dining room. Napoleon's wedding to Josephine. Old Paris Vase. Master Bed Room. This French Brass fireplace screen is the most romantic of all. Two cherubs are building a fire. 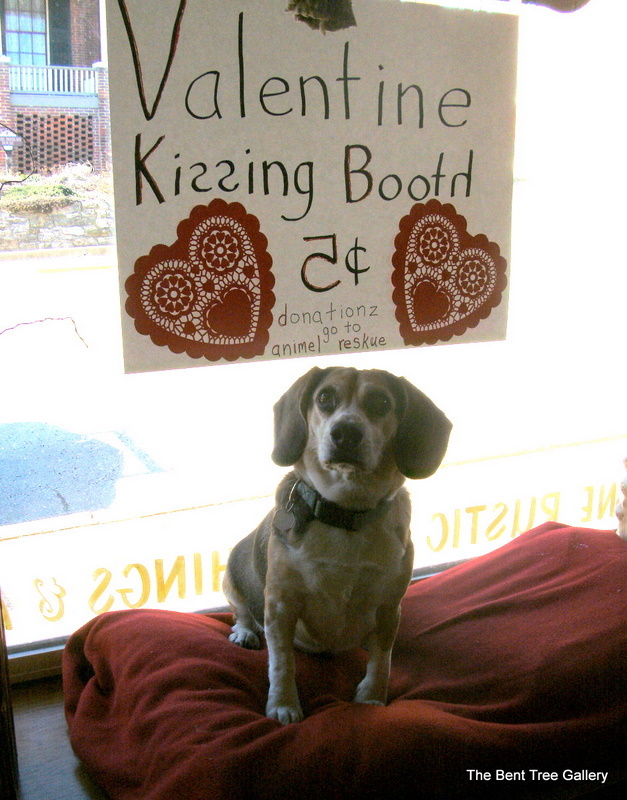 My shop neighbor and good friend, Marcia, is having a kissing booth to raise money for stray dog care. This is her Grand Dog, Shotgun. Sissy will go take a turn after a bit.Kiss,Kiss!